It is even more difficult to discover the Common Rock Thrush. Raimund Scheicher, an early ornithologist, reported shortly before the First World War about his ornithological excursions in the area of ​​Freiburg and in the southern Vosges. 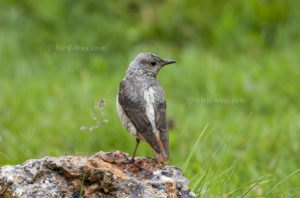 He was able to observe in July in the Vosges mountains at the Rotenbacher Kopf (head), south of the Hohneck, a pair of Common Rock Thrushes, which was staying in the steeply sloping east rock. Unfortunately, the pair was made flying by tourists who settled on the summit. He writes that the birds like the Wheat-wheat species like to sit on way-markers and other elevated points. As a warning call he describes a snarling “kerrt”, deeper and shorter than the snarl of the Mistle Thrush (Turdus viscivorus). On about 5,000 hectares, over the highest elevations, extend the Haut Chaumes – almost treeless high pastures. Massive deforestation in the Middle Ages followed by centuries of grazing are the cause of the disappearance of the forests. Blueberries (Vaccinium myrtillus) and heather (Calluna) cover wide areas and provide for pagan blossom in early summer and in autumn, when the blueberry shrubs turn red, for dramatic color schemes. In many places, the landscape is reminiscent of Scandinavian tundra or the Scottish Highlands. The nutrient-poor, stony soils and the extensive pasture provide the basis for a diverse flora with numerous alpine elements. Great Yellow Gentian, Mountain arnica, Alpine Pasqueflower and the endemic Mountain Pansy grows in large numbers along the trails. Early in the morning, just before and after sunrise, when the wind has not yet awakened, the best opportunities arise to photograph the flora of the high pastures best. Many nature photographers come to the Vosges to photograph Chamois (Rupicapra rupicapra). This means to get up early, so you stay in time for sunrise on one of the peaks around the Hohneck. In the fifties of the 20th century, chamois from the Black Forest were settled in the Hoheneck area. They have long since become an integral part of the fauna. One of the best places to photograph Chamois is the Rothenbachkopf about five kilometers south of the Hoheneck. In the early morning you can often see the chamois there in the high pastures – sometimes in large groups. During the day, they often retire to the rugged, inaccessible cliffs and scree slopes. The morning hours of spring and autumn are the best opportunities for photographing chamois. In summer, the considerable number of hikers ensures that the animals usually hide. In winter, they walk down into the snow-poorer valleys and only return to the high pastures with the snowmelt.